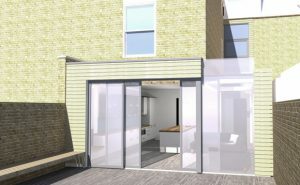 We are currently working on proposals for the remodelling of a house with wrap around extension in Hillier Road, south London. The glass and timber extension replaces an existing low grade lean to. The timber cladding wraps along and around the back of the extension, folding into a garden bench and bike store. Frame-less glass to the extension roof and rear adds to the contemporary feel of the design. Work is due to start on site later in 2012.